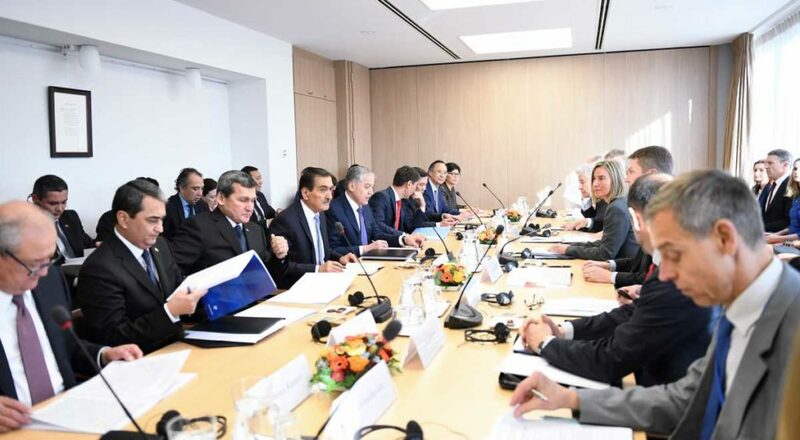 BRUSSELS – The Belgian capital hosted the Nov. 23 European Union-Central Asia ministerial meeting attended by the foreign ministers of Kazakhstan, Kyrgyzstan, Tajikistan, Turkmenistan and Uzbekistan and the European Union’s High Representative for Foreign Affairs and Security Policy Federica Mogherini. Photo credit: Ministry of Foreign Affairs. The agenda focused on a new draft of the EU Strategy on Central Asia. According to Kazakh Foreign Minister Kairat Abdrakhmanov, Central Asia is one of the world’s most dynamically developing regions which plays a strategic role and has significant human and high economic potential, including excellent natural and industrial resources. In its vision of the new strategy, the Kazakh side emphasised developing human capital through education, promoting the rule of law and high-quality public administration and developing private entrepreneurship and small and medium-sized businesses focused on women’s entrepreneurship. The delegation noted Central Asia’s growing involvement in global economic processes also requires closer cooperation between the regions, including introducing a new technological paradigm and digitisation elements, interfacing transport and logistics infrastructures, sharing experience in energy efficiency and introducing green technologies. The issues of environmental protection and rational use of water resources, as well as joint assistance to help restore and stabilise Afghanistan, are critical. According to the Kazakh side, these and other measures should be taken into account in the document. In addition, Abdrakhmanov drew participants’ attention to the main provisions of Kazakh President Nursultan Nazarbayev’s article, “Seven Facets of the Great Steppe.” The writing details how Kazakhstan plans to implement large-scale projects to update the centuries-old historical heritage and adapt archival, archaeological and other data to be understood and used by citizens at the age of digital civilisation. EU and Central Asia interaction vis-a-vis the Eurasian Economic Union (EAEU) and the Belt and Road Initiative, the largest economic projects in the Eurasian space, can make Central Asia an important link in global economic relations. The minister spoke about Astana’s readiness, if necessary, to provide a platform to start dialogue on EU-EAEU-China interaction. Abdrakhmanov drew attention to the need to comply with three key elements to implement the document: ensuring cooperation integrity in the EU-Central Asia format and creating more flexible tools to practically implement the strategy, as well as enhancing its visual perception. To achieve the latter, Kazakhstan proposed creating a single online portal that would provide “virtual institutionalisation” of cooperation and could become a universal online window to Europe for 70 million Central Asians. Abdrakhmanov and Mogherini later discussed the progress of ratifying and implementing the Enhanced Partnership and Cooperation Agreement (EPCA) between Kazakhstan and the EU, as well as the outcomes of the 12th Asia-Europe Meeting (ASEM) summit and issues of international and regional cooperation. Kairat Abdrakhmanov and Federica Mogherini. Photo credit: Ministry of Foreign Affairs. The EU is Kazakhstan’s largest trade, economic and investment partner, accounting for approximately half of its foreign trade and investment, and is one of the priorities of the country’s foreign policy, noted Abdrakhmanov. Kazakhstan ranks 32nd among the EU’s largest trade partners, while its share of the EU trade turnover with Central Asia is approximately 80 percent. In the past two years, trade between Kazakhstan and the EU has shown steady average growth of 20 percent and the objective for the coming years is to diversify trade and economic cooperation. In this context, the sides have high hopes for the EPCA and intend to use the full potential of the new document. 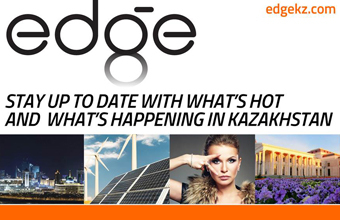 As part of the EPCA, Astana is aiming at further rapprochement between Kazakhstan and the EU. Easing visa restrictions for Kazakh citizens visiting the EU is a priority, said Abdrakhmanov, expressing hope that relevant negotiations will begin after the EU adopts a new union code on visas. 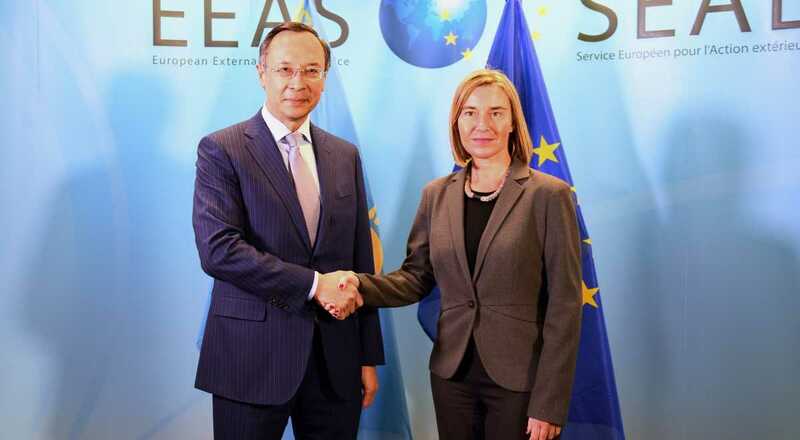 Mogherini underscored the relevance of ongoing political and administrative reforms in Kazakhstan that provide a solid basis for engagement between the nation and the EU. She also stressed the country’s important role in regional processes and the significance of initiatives that contribute to deepening regional dialogue. The sides talked about the EU strategy on connectivity with Asian countries which it presented at the ASEM summit. Kazakhstan found the document provisions relevant and was ready to participate in its practical execution.